Eugene Laverty testing the Milwaukee Aprilia at Jerez in Spain. Eugene Laverty has hailed the progress made with the Aprilia RSV4 over the past few years as the Northern Ireland rider made his World Superbike return at Jerez this week. 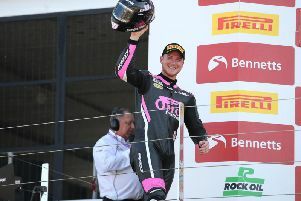 The Toome man participated in a private three-day WSBK/MotoGP test at the Spanish circuit, where he was in action for the first time for his new Milwaukee Aprilia team after a two-year stint in the Grand Prix premier class. Laverty, who finished as the runner-up in the 2013 World Superbike Championship as an official factory Aprilia rider, said he achieved the majority of his goals during the test, despite less than perfect weather at Jerez on Monday and Tuesday. “The Aprilia has definitely improved,” Laverty said. “It was good back then but some areas have improved right away. The guys had told me that in 2014 they’d made a big step and you can see that. Towards the end of ’14 Sylvain [Guintoli] and Marco [Melandri] were dominating. “It looked like they’d made a big step with the bike and it looked like it was a lot easier to ride and it definitely is,” he added. “The bike was always good and looked after the tyres well, but it could still be difficult towards the end of the races. It often became more of a handful. “Now I’d be happy to go out and do a 20-lap rung whereas three years ago I would have dodged that in testing because it used to really sap the energy out of you. Now the bike is a lot more manageable. Laverty, who won’t ride the machine again until the New Year with the winter testing ban set to kick in next week, tested two different engine specs plus some chassis parts alongside new team-mate Lorenzo Savadori. “The target was to get really comfortable on the bike because that often takes a few days to feel 100 per-cent on it. We sorted out the seat positions the other day and we were ready to go,” he said. “It helps that Lorenzo has ridden this bike previously so we were able to get comfortable on it straight away. Today [Wednesday] we tested some different engines and chassis parts so we’ve had a busy day but it went well. Laverty also used the test to adapt to the Pirelli tyres after using Bridgestone and Michelin rubber in the MotoGP class in 2015 and 2016 respectively. “I’m surprised just how much grip the tyres have when it first hits the gas,” he said. “Yesterday morning [Tuesday] there were still some damp patches, it looked relatively dry but there were still a lot of damp patches out there. With these tyres it seems that the bike doesn’t react as much to the wet. Reigning double world champion Rea has topped the WSBK times at the test this week on the Kawasaki ZX-10RR and has ruffled the feathers of the MotoGP riders, dipping under Valentino Rossi’s 2016 pole time yesterday. Rea lapped in 1m 38.721s to head the times sheets from MotoGP rider Alvaro Bautista (Aspar Ducati) by 0.225s, with Chaz Davies third fastest on the Aruba.it Ducati. Rea’s team-mate, Tom Sykes, was fifth quickest yesterday.